Morning in the Elgin Valley, South Africa starts with an Elgin Chardonnay technical presentation by Richard Kershaw MW, followed by lunch at Rockhaven Boathouse. After lunch, two tutored tastings featuring two flights of six wines each will be hosted by Jamie Goode. A selection of 2013 Elgin Chardonnays will be served at a gala dinner in the evening at Rockhaven. 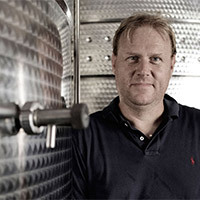 One of only 10 Masters of Wine who actively make their own wines, Richard Kershaw is pursuing his dream in Elgin in the Overberg region of the Western Cape. 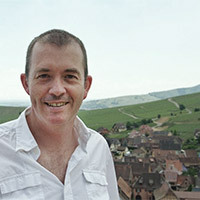 He focuses on cool climate, site-specific, clonally selected wines. Two flights of 6 wines each during each session, hosted by Jamie Goode, a London-based winewriter who is currently wine columnist with UK national newspaper The Sunday Express. As well as writing he also lectures and judges wine. Dinner served with a selection of 2013 Elgin Chardonnay's. A tantalising lunch prepared by one of South Africa's top culinary talents, Craig Cormack, paired with Paul Cluver and Sutherland Chardonnays will follow. A sit-down tasting of five vintages of Oak Valley and Elgin Vintners Chardonnays, followed by a scrumptious "Pork it Up" menu courtesy of Chef Gordon Manuel. A surprise three course lunch with Chef Pellie Grobler from Pretoria's top gourmet restaurant, Black Bamboo will be paired with chardonnays from South Hill, Neil Ellis and Matthew van Heerden. A superb lunch prepared by Rozy Gunn will be paired with a selection of five vintages of the Iona Chardonnay and will be rounded off with specially selected white cheeses to complement Chardonnay. Almenkerk Wine Estate, Boschendal, Corder Family Wines, Elgin Vintners, Iona, Highlands Road, Lothian Vineyards, Oak Valley, Oneiric, Paul Cluver Wines, Neil Ellis Wines, Matthew van Heerden, South Hill, Sutherland Vineyards and Richard Kershaw.